The PowerMate LiftGate Series of machines are Interior Lift Systems similar in function to an exterior fold down lift but with distinct advantages - and at a fraction of the price! All LiftGates are mounted inside your vehicle out of the elements and all have a swing arm that allow you to position the load inside the vehicle and saves you from having to manhandle the load. There are two main variations of the LiftGate, the LG-3 and LG-6. 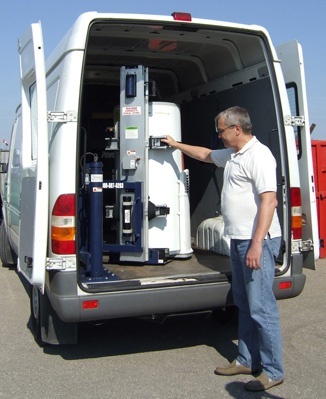 Both versions can be equipped with left or right hand mounting configuration and with two different lifting capacities. However, the LG-6 has 12 inches more lifting height than the LG-3. The PowerMate LiftGate LG-3 interior tailgate lift is a unique solution for full size vans and Sprinter vans and has a lifting height of 28". 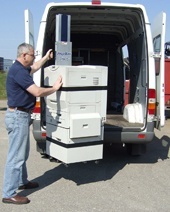 The LG-6 has a 40" lift and is the ideal solution for Cube Vans or Box Vans. Either LiftGate can be ordered with a 250 or 500 lbs capacity (the 250 lbs capacity LG's are slightly faster than the 500 lbs versions). 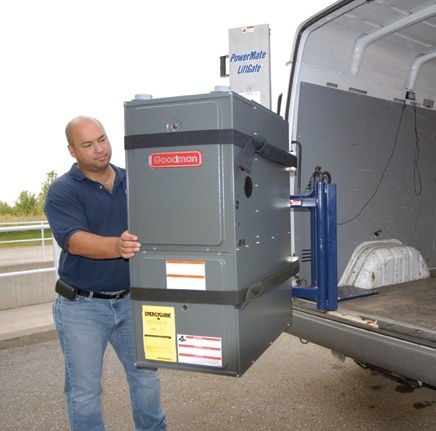 LiftGates can be installed in your fleet vehicle at the time of purchase which allows the LiftGate to be financed as an operating expense instead of a capital expense. The LiftGate has a small footprint at just 1.5 square feet. However, the swing arm is able to load cargo well into the truck interior, saving you aggravation and protecting your back from strain injury. Right and left hand mounts are available. Installation can be completed, usually within 24 hours and for under $500, meaning very little down time for your vehicle! 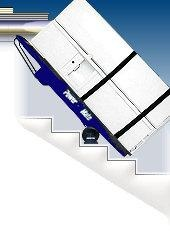 LiftGates can be outfitted with a cylinder attachment or hot water heater attachment! 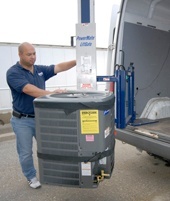 The LiftGate is versatile; load HVAC-R products, compressed gas cylinders, office machines, copiers and just about any load that you might find in your van. LiftGates draw power directly from your vehicle's 12 volt electrical system. 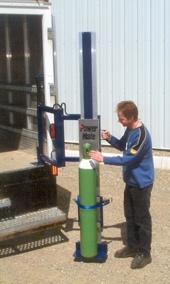 Our 1-800 number, along with our load moving guidelines, are prominently displayed on your PowerMate. Our customer service personnel are always happy to help with on-site support. The PowerMate LiftGate LG-6 has a 28" lift and is ideal for regular size & Sprinter vans. The PowerMate LiftGate LG-6 has a 40" lift and is ideal for cube vans and box trucks. 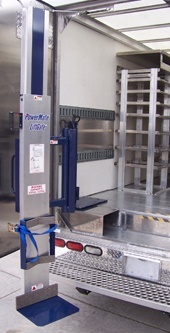 The PowerMate LiftGate comes complete with mounting system, DC power connection kit and cradle attachment for cylinders. 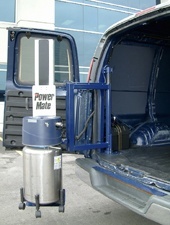 PowerMate can usually arrange installation of your LiftGate locally. 900 mm or 35 3/8"
or 26" x 13 1/2"
The PowerMate LiftGate is our cost effective alternative to a rear mounted fold down tailgate lift. 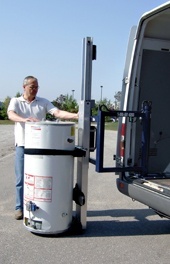 The LiftGate is ideal for loading compressed gas onto trucks and vans. 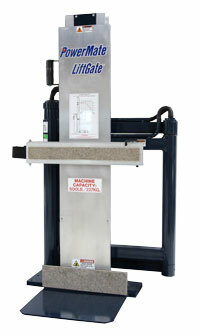 Lincare uses LiftGates for home medical delivery. 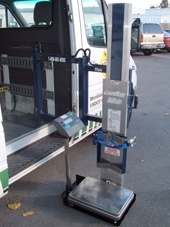 Shown above is a side door mounted LiftGate with a cylinder scale. Strain Out Of Moving . . .